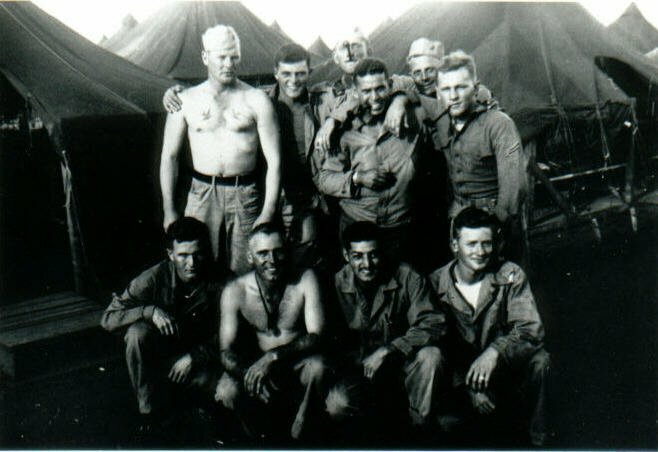 Sergeant Mike Frihauf’s squad at Camp Maui, spring of 1944. Camp Maui as seen from the air. Official USMC Photo. The Marines arrived at Camp Maui with a whirlwind of activity and emotion. They had just faced their first combat; their stained dungarees set them apart from the “rear-echelon pull,” many were struggling with memories of combat, the loss of friends, or slight wounds. Each company found a built-in welcoming committee in the contingents left behind to handle the administrative task of transferring an entire division from base to base; clerks, staff officers, and some men deemed not suitable for combat crowded around the friends they had trained with, taking stock of souvenirs and listening eagerly to stories. Exhausted from their cruise, the Fourth Division was happy to set foot on friendly soil for the first time since the thirteenth of January. The island was quiet and clean, free of blasted tree trunks, shell holes, the smell of death and the odious task of cleaning up a combat area.10 Surely, they thought, here was paradise. View of the eastern portion of Camp Maui. 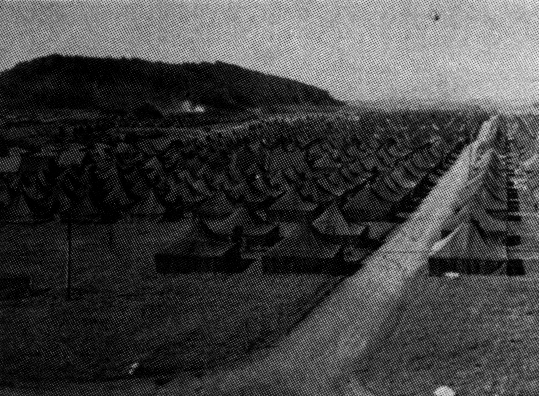 The 23rd Marines inhabited these tents. Official USMC Photo. Outdoor bathing facilities, Camp Maui, 1944. Official USMC Photo. Work had begun on new training areas for machine guns, grenades, demolitions, bazookas, tanks, and artillery, but no one wanted to think about drill. For the first week after their arrival, most Marines were left to their own devices. “Life here is not bad at all – they call it a rest camp, and strangely enough they almost mean it,” wrote Phil Wood. Souvenir photos were perennially popular. All photos are from the author’s collection. Some Marines found less conventional approaches to pursuing the local girls. On an errand to enlist civilian help for a battalion’s worth of khaki laundry, Lieutenant Wood and Captain Irving Schechter took a long jeep drive to the other side of the island. There they found a “sleepy and quiet” town, where the overseer of the local plantation took them on a tour while trying to find a laundress. The Marines visited several households, even sharing tea with an old Japanese couple, before acquiring the services of a Filipino household. “[The] three young daughters chatted gaily with us. The eldest was getting married in a few days – we happened to have liberty then, so she invited us to the party,” wrote Wood. When we got there, it had already been going on for twelve hours – her family had built a shack – just a frame with a floor out in the middle of what in New England would be the town common – didn’t look much like one – a stretch of bare brown earth, packed hard by the hordes of barefooted children, and shaded by varieties of these fantastic flowering trees. The shack was shingled with palm leaves that glowed green fire when the sunlight hit them – the pillars inside were twined with orchids and ropes of flowers that looked like tiger lilies. 50 or 60 people were inside, dancing to the native orchestra – sometimes the native dance, and sometimes “Melican style.” We hadn’t entered the door before the bridegoom’s brother grabbed us, piloted us over to a table, and heaped our plates with Filipino food…. There were drinks – some sort of punch, but it must have been mild, for no one was drunk. Two enlisted men from A/1/24 wound up with “the perfect setup,” according to Wood. Boxing matches, whether formal or not, were popular spectator sports. Officers of the 24th Marines watch a prizefight on Maui during the spring of 1944. The captain at center is Irving Schechter of A/1/24; the lieutenant at left is Bill Carbeau, B/1/24, killed in action on Saipan. Photo by Harold Rediske. PFCs Richard Dues and Bernard Elissagaray joined A/1/24 in the spring of 1944. Dues was 18, Elissagaray 17. In addition to the new structure, there were new replacements to train and get to know. “The D-1 section and its subordinates were faced with the problem of the acquisition and disposition of the Division’s personnel,” wrote John Chapin, a lieutenant serving with K/3/24. “The casualties at Kwajalein had to be taken into account: how many were permanently lost to the Division, how many would eventually be coming back to duty, when, etc.? The replacements that had been received had to be apportioned to the various units to fill their gaps and bring them up to full strength.”37 The division’s losses had been relatively light compared to bloodbaths like Guadalcanal or Tarawa, but the integration of new men still posed a problem. “The replacements that arrived to fill the gaps left by Namur’s casualties (in the Kwajalein battle) had to be trained in all the complexities of field work,” explained Chapin. 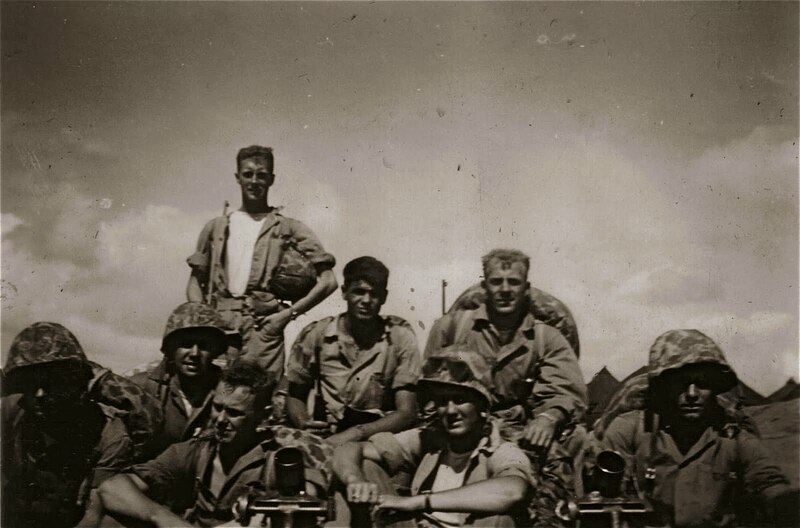 “Most of these replacements were boys fresh from boot camp, and they were ignorant of everything but the barest essentials.”38 Baker Company, 24th Marines – one of the hardest-hit units in the late battle of Namur – was faced with integrating over eighty men into the ranks, a combination of administrative personnel, reassigned machine gunners, and replacements. New squads and new platoons were organized, new leaders were promoted, and new assignments were doled out – all of which took time to implement. 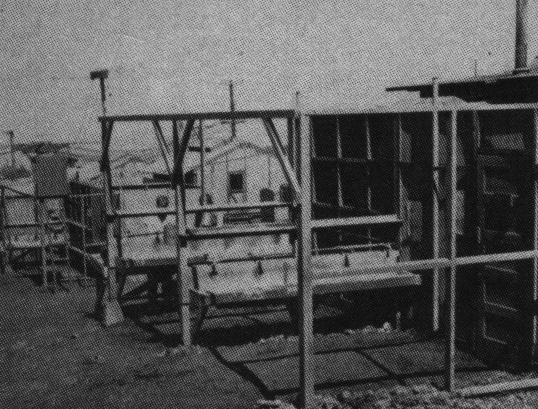 “It was immediately apparent that the continuation of camp construction and maintenance, the anticipated delay in replacing essential equipment, the acquisition of ranges and maneuver areas, the adverse weather conditions, and the requirements of reorganization and rehabilitation would all contribute to the difficulty of executing a coordinated and progressive schedule of training,” read the Fourth Division’s report on the battle of Saipan.39 The Division Training Directive, issued on March 3, proved impossible to follow completely. Most of the established areas, such as firing ranges and training courses, were run by the Army and Navy; with each branch of the service training for the next operation, the Marines rarely had first crack at them. About 35 [medals] were awarded, and almost 90 percent of them went to the 24th Marines. No Congressional Medals were awarded, but 6 Navy Crosses were – the next highest honor. Colonel Hart got one, a company commander in the 2nd Battalion got one, and four were awarded to enlisted men – one man in “B” Company and 3 in “A” Company! Think of it! There are about 65 companies in the Division, and “A” Company got 3 out of the 4 awards made to enlisted men! And to top it all, two of those men were in my platoon! [Corporal Arthur B.] Ervin and [Sergeant Frank A.] Tucker. I felt pretty damned proud, I can tell you – not many Platoon leaders in the American forces can say anything like that. Ervin told me after it was over that he almost burst into tears when they told him he was getting the Navy Cross – he meant it, and for a tough, hard-bitten little guy like that to feel that way. Phil Wood (standing) with his mortar section, April 1944. On May 8, 1944, the Fourth Division began embarking aboard transports for a division-wide rehearsal. Several days of exercises followed, with Marines clambering down nets or driving in amphibious through the huge doors of specialized landing ships, then churning towards the shores of Maalea Bay. Peaceful Kahoolawe Island was bombed, strafed, and overrun by the 23rd and 25th Marines. Apprehension grew as the veterans recalled their experiences on Roi and Namur and the new men desperately wondered how they would fare in battle. Ships burn at West Loch on May 21, 1944. The fleet departed for Saipan eight days later; the Marines learned of their destination, timetable, and role in the coming battle only after losing sight of the coast of Hawaii. Few could imagine how they would welcome the rainy, unfinished confines of Camp Maui upon their return in August. For many, it would be their last glimpse of a peaceful world. Citizens of Maui greeting the division at the docks on August 24, 1944, could not help but notice the difference in the men they were beginning to think of as “Maui’s Own.” The Marines had been in transit or in combat since the end of May. Far fewer trucks were required to transport the men up the long hill to the gates of Camp Maui, and those who climbed into the trucks had lost a significant amount of weight; their staring eyes appeared huge in shrunken faces. They had been out of combat for slightly over two weeks and the strain was beginning to ebb – but conquering two heavily-defended islands within six weeks had taken an undeniable toll on the survivors. 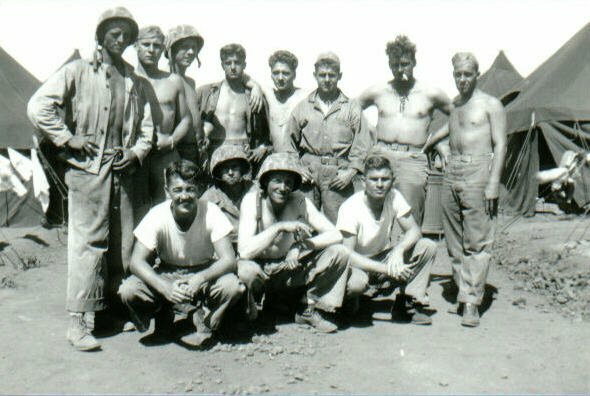 Baker Company of the 24th Marines departed with 224 men and returned with just over ninety; this ratio was not uncommon for other companies.55 The discomforts of living in tents in the rain must have been forgotten in light of recent experiences living in muddy holes without cover, facing Japanese bullets. As had happened after Kwajalein, the Marines were allowed some time to themselves upon their return. Planners were ready to roll out a new four-part itinerary to get the division ready for their next assignment; but from late August until September 10, few formal activities were scheduled. As after Kwajalein, letter writing was often the first order of business. The Marianas campaign had been a lengthy fight, and most men – especially those who had suffered superficial wounds – sent missives to their families, all of whom had been following the news with dreadful anticipation. Others wrote letters to the families of friends who had been killed. 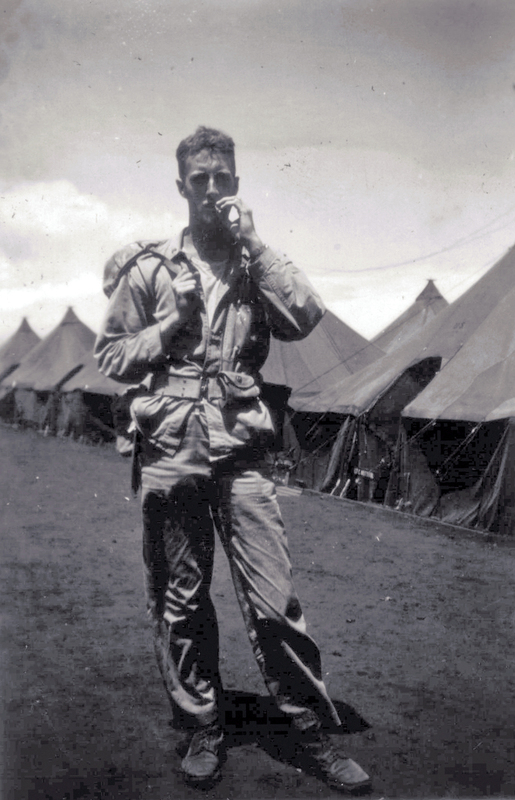 Lieutenant Frederic Stott (C/1/24) was typical of those who sent condolence letters; his friend Philip Wood had been killed on Saipan, and Stott’s letter provided Wood’s family with details and closure that were painfully absent from the standard Western Union telegram. The rigorous training for Operation Detachment – the code name for Iwo Jima – began on September 10, 1944. After considering the deficiencies of the previous spring’s regimen, the upper echelons decided on a four-phase schedule. 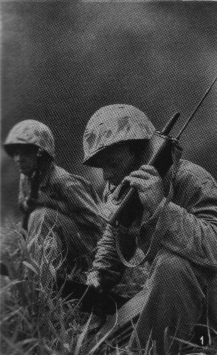 Phase One, lasting four weeks, concentrated on individual and basic training “with proficiency in use of weapons and discipline the primary objectives.”59 Though the veteran Marines felt that they had more than demonstrated their proficiency with their weapons while fending off banzai charges on Saipan and Tinian, they were compelled to practice alongside the replacements. Fortunately, Camp Maui was better prepared to meet the needs of the Marines in the latter months of 1944. 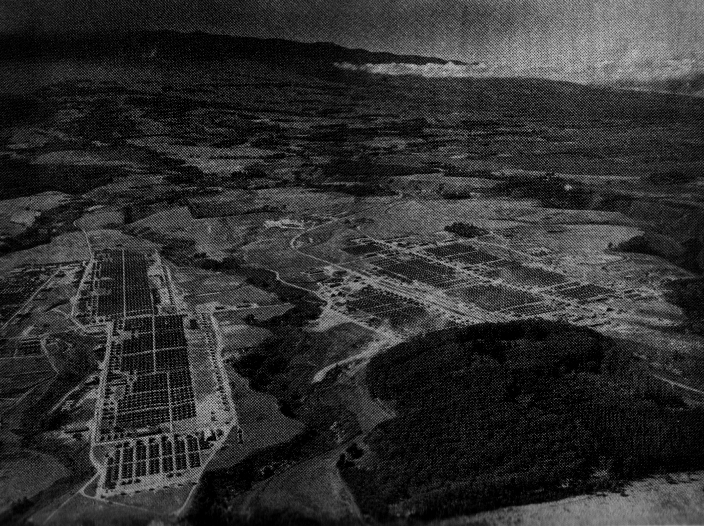 More firing ranges had been constructed while the Division secured the Marianas; Opana Point boasted the largest rifle range in the Pacific with one hundred individual targets.60 “On the outskirts of camp, a demolitions area, a live-grenade course, a pistol range, and 1,000-inch machine-gun range were set up,” reported Dempsey. “Five miles east of camp, in a gulch opening into the sea, was the Division’s bazooka area, and along the coast, east of camp for about ten miles, were combat firing ranges which permitted the maneuvering and firing of tanks and halftracks in coordination with the infantry.”61 The scheduling problems that had plagued the Marines before Saipan had been mitigated by the camp’s expansion. The restraint of most veterans faded somewhat over the long winter months. Alva Perry found a close friend in Eddie Bookwalter, a draftee assigned to his platoon in A/1/24. The two were unlikely friends. Bookwalter, age 27, was a tattooed and heavily-muscled fisherman from Tacoma, Washington and had once hoped to join the American Olympic swimming team. Perry hailed from Nashville, volunteered for the Marines at seventeen, and was a corporal by nineteen. Though Bookwalter was older, Perry outranked him and had the added luster of three campaigns, a Silver Star medal, and a tally of dead Japanese notched on the stock of his BAR. Bookwalter, impressed by the young corporal, mentioned his history as a wrestler and claimed to want nothing more than to wrestle an Imperial soldier to death. Soon the two were inseparable. 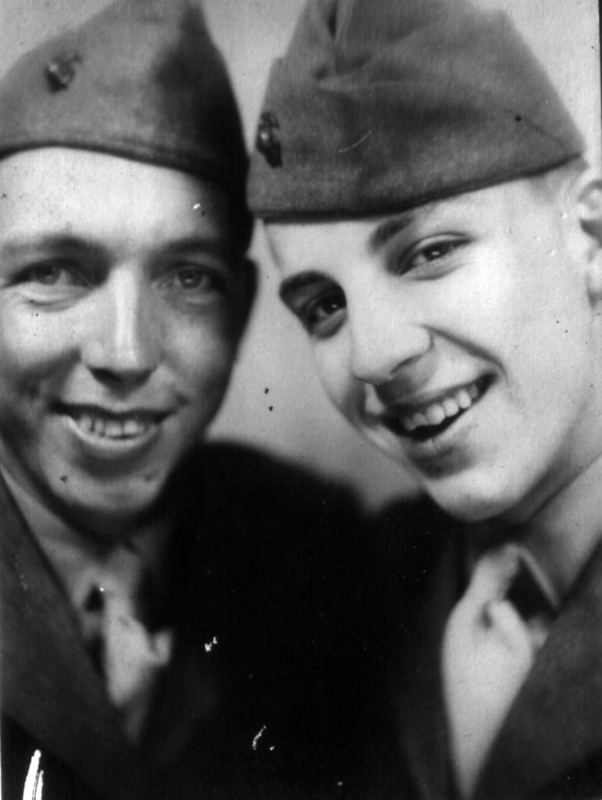 Perry vowed to join Bookwalter on his fishing boat after the war and received letters and photographs from Bookwalter’s wife, Mary.68 The bonds of comradeship would serve them well in the coming months as they faced combat on Iwo Jima. Perry’s friend Eddie Bookwalter is the shirtless Marine with the swallow tattoos. Photo by Alva Perry. 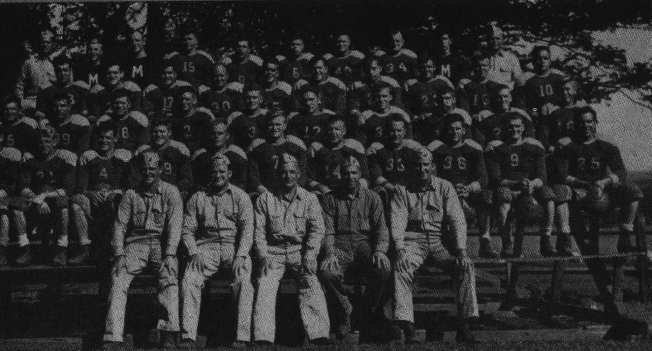 The undefeated 1944 football team, Camp Maui. Official USMC Photo. Marines continued to hitch rides to town; Jim Craig was often tasked with driving to the local jail, collecting the forlorn men picked up for drunkenness or troublemaking, and returning them to camp.71 Others forged romantic relationships, though steady girlfriends “were seldom,” according to Al Perry. Perry met a high-school girl in Paia who was working at a halfway house for alcoholics. The girl was of Japanese ancestry. Perry was invited to meet her parents; he got cold feet after seeing photographs of a relative who “looked remarkably like Tojo.” Realizing that “this would never work,” Perry fled the house and never saw the girl again.72 Holidays like the Marine Corps birthday, Christmas, and New Year’s Eve were marked by improved chow and drinking binges and provided another welcome respite from training. New Year’s Day, though, provided a change of a different sort; the Marines gathered their personal equipment, formed ranks, and proceeded to Kahului Harbor. There, they once again embarked aboard the hated attack transports for days of rehearsals interspersed with brief trips ashore to Pearl Harbor. On January 27, the rehearsals ended, and the Fourth Division set sail for Operation Detachment. 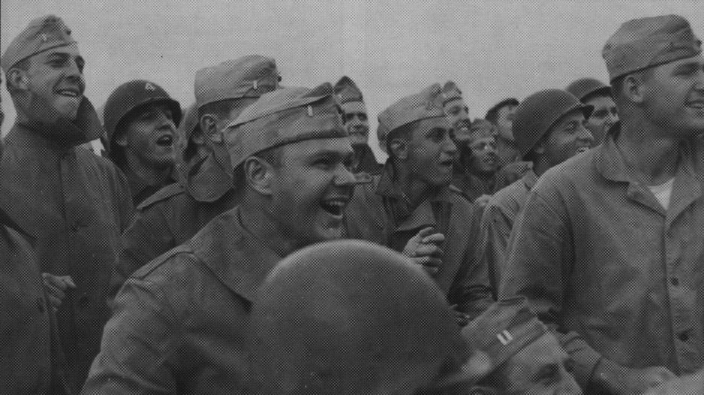 Veterans prayed that their luck would hold for one more tour; replacements looked forward to the test of battle with apprehension and excitement. Hi, you Marines! Welcome home! It’s no “snow job” when we tell you that the servicemen and women and the civilians of Maui are throwing this big shindig for you because we think you’re just about the greatest guys that ever landed on this Island. When the news came over the radio that the Marines had hit Iwo Jima, everybody asked the same question: “Are the Maui Marines there?” Then we heard the newsflash that you and a lot of other Marines were in there pitching. After that, nothing else that happened seemed to matter very much. We don’t need to tell you that everyone from Hana to Lahaina is mighty proud of you. And when we read that you had named that first street “Maui Boulevard,” we were practically bursting at the seams. So welcome to Maui – the old friends and the new! Welcome to Iao Valley and Haleakala – to the rainbows and the rain (that everlasting rain at Camp Maui) – the steaks and the banana splits – the pineapples and the poi – the carnation leis and the steel guitars. But, most important of all, welcome back to all the folks on Maui who think it might be a pretty good idea to add a new word to the famous slogan MAUI NO KA OI and let the world know it is now MAUI MARINES NO KA OI! Marines disembarking from a transport at left are given a traditional Hawaiian greeting; the trucks passed under a celebratory sign as they drove to Camp Maui. April 4, 1945. Today, few of Camp Maui’s buildings remain. The ground is now a public park; Giggle Hill has a large children’s playground, and some claim they can hear the laughter of Marines and their girlfriends on dark nights. The centerpiece of the park is the memorial to the Fourth Marine Division, whom the people of Maui still consider heroes. 2Dempsey, MSgt David. The Fourth Marine Division In World War II. Reprint, Capt. Carl W. Proehl, ed. Nashville, TN: The Battery Press, 1988. pg 120. 3Kanda, Al. “Camp Maui.” http://www.maui-meshworks.com/campmaui.htm. Updated May 8, 2009; accessed March 14, 2010. 4Department of the Navy. Building The Navy’s Bases In World War II: History of the Bureau of Yards and Docks and the Civil Engineer Corps, 1940-1946. Vol. II. Washington; United States Government Printing Office, 1947. pg 152. 6Wood, Philip E., Jr. Personal letter dated February 27, 1944. 7Wood, Philip E., Jr. Personal letter dated February 13, 1944. 9Perry, Alva. “ A Personal History of the Fourth Marine Division in WWII.”http://mysite.verizon.net/res71z3x/history_of_fourth_division_final.htm. Accessed March 13, 2010. 10Somewhat perversely, the front-line Marines were compelled to clean up their own areas of combat following the fighting on Roi-Namur. The negative reaction was so strong that the division’s official report on the action specifically forbade the practice for combat troops and assigned it instead to rear-echelon units. 12Chapin, Captain John C. The Fourth Marine Division in World War II. Washington, DC: History and Museums Division, Headquarters , U.S. Marine Corps, 1974. pg. 13. 13Goldberg, Harold J. D-Day In The Pacific. Indianapolis; Indiana University Press, 2007. pg 43. 14Wood, Philip E., Jr. Personal letter dated February 27, 1944. 17Wood, Philip E., Jr. Personal letter dated February 27, 1944. 19Seymour, John, et al. “Company C, 1st Battalion, 23rd Marines.”http://www.c123rd.com/node/34. Accessed March 14, 2010. 21Seymour et al. http://www.c123rd.com/v1/Chap06.html Accessed March 14, 2010. Cates circulated a memo to all units in the division after Iwo Jima, stating that the money for “goods received” would come from the division’s Rec Fund. 22Perry, http://mysite.verizon.net/res71z3x/history_of_fourth_division_final.htm. Accessed March 14, 2010. After three tours through Camp Maui, Perry had similar feelings towards Spam and Hawaiian music. 23Wood, Philip Emerson. Personal letter dated February 27, 1944. 24Perry, http://mysite.verizon.net/res71z3x/history_of_fourth_division_final.htm. Accessed March 14, 2010. 25Wood, Philip Emerson. Personal letter dated March 3, 1944. 27Wood, Philip Emerson. Personal letter dated May 6, 1944. 28Ako, Sam. “Haiku: 4th Marine Division Park.” Maui Weekly, Maui, HI. July 13, 2009. Web. http://www.mauiweekly.com/page/content.detail/id/500017/Ha-iku-4th-Marine-Division-Park-.html “Giggle Hill” is the site of the 4th Marine Division Memorial Park. 29Wood, Philip E., Jr. Personal letter dated April 6, 1944. 30Wood, Philip E., Jr. Personal letter dated March 16,1944. 31Nordlie, Donald. “The Leatherneck.” Transcribed by the MGG Project Team.http://people.mnhs.org/mgg/story.cfm?storyid=522. Accessed March 15, 2010. 33The infantry regiments of the Fourth Division were composed of three battalions apiece; each battalion contained four companies lettered A-M (excluding J). The fourth company of each battalion (D, H, and M for First, Second, and Third Battalions) was designated as “weapons company” and fielded three platoons of heavy machine guns and one of 81mm mortars. Each MG platoon was attached to a rifle company in combat, while the mortars attached to battalion headquarters. 36Buzzard, Glenn; quoted in Smith, pg 83. 37Chapin, Captain John C. The Fourth Marine Division in World War II. pg. 13. 38Chapin, Captain John C. Breaching the Marianas: The Battle For Saipan. Washington, DC; Marine Corps Historical Center, 1994. pg 6. 39Fourth Marine Division Operations Report Saipan: 15 June to 9 July 1944. pg 8. 40Ibid. “Annex I – Report of RCT 24.” pg 1. 42Chapin, Breaching the Marianas: The Battle For Saipan. pg 6-7. 43“Annex I – Report of RCT 24.” pg 6-7. 44Smith, George A. Email received 2007. 45Wood, Philip E., Jr. Personal letter dated March 16, 1944. 46“Annex I – Report of RCT 24.” pg 5-6. 49Ibid. Lieutenant Wood is slightly off on his recounting of the distribution of medals. Division-wide, four Medals of Honor were awarded (three posthumous, one to a man in the hospital); seventeen Navy Crosses, one Distinguished Service Medal, sixty Silver Stars, twelve Legions of Merit, forty-five Bronze Stars, and 611 Purple Hearts. 50Wood, Philip E., Jr. Personal letter dated May 6, 1944. 51Smith, George A. Personal interview, 2009. 53Wood, Philip E., Jr. Personal letter dated June 15, 1944. This is the last line from the last letter Phil Wood ever sent; the date is that of the landing on Saipan. 56Shivley, John C. The Last Lieutenant. New York, NY: New American Library, 2002. pg 45. 57Craig mentions only the last names of Makowski and Young (the company executive officer); he never learned the real names of “Smokey Bear” and “Turkey Hughes,” leaders of the machine gun and mortar sections, respectively. 59Fourth Marine Division Operations Report: Iwo Jima. “Annex George: RCT 24 Report.” pg 2. 62“Annex George: RCT 24 Report.” pg 2. 77Lt. Howard “Smiley” Johnson was killed in action on February 19, 1945. 81Perry. http://mysite.verizon.net/res71z3x/history_of_fourth_division_final.htm. The Marines instituted a points system whereby those with longer service or previous wounds were rotated home for discharge first. Perry also claims that two of his cohort of 27 survivors went “over the hill” so they could stay with their Maui girlfriends.